On Sunday 3 June families around the country will celebrate National Cancer Survivors Day and none more so than the Kemish family from Totton whose eight year old son McKenzie reached the milestone of being five years cancer free in December 2017. The family celebrated at the time and McKenzie wore a specially made T-shirt to school celebrating his cancer free status. They are now preparing to celebrate again to mark National Cancer Survivors Day and to thank Rainbow Trust Children’s Charity who have supported the family since McKenzie was first diagnosed with stage 4 Neuroblastoma in October 2011, when McKenzie was just two years old. 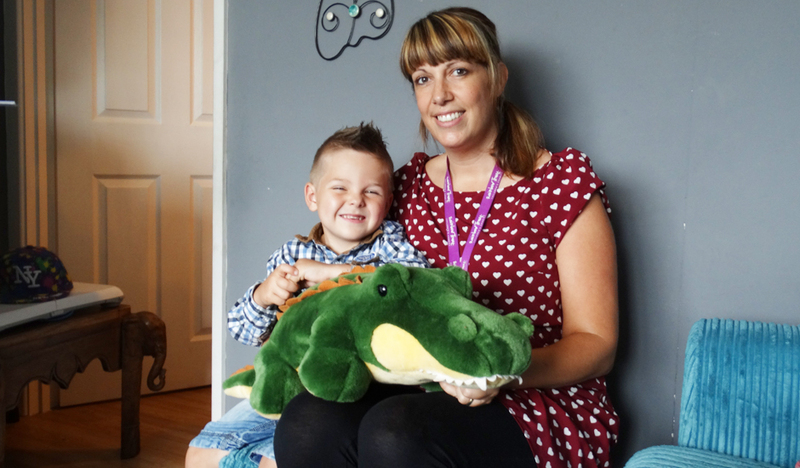 “We were introduced to Dawn, one of Rainbow Trust’s Family Support Workers, in the hospital playroom just six weeks after the diagnosis, and she asked us how she could help. I told her I wanted someone to play with McKenzie’s brothers and sisters and bring some fun back into their lives. Dawn and the children clicked immediately.